Persistence Market Research (PMR) delivers a detailed analysis of the global methyl ester sulfonate market in its report titled “Methyl Ester Sulfonate Market: Global Industry Analysis 2013–2017 and Forecast 2018–2026”. The main objective of this report is to provide comprehensive analysis and insights pertaining to the methyl ester sulfonate market. This report offers an in-depth study of the global methyl ester sulfonate market, in terms of market volume (KT) & value (US$ Mn), and year-wise (Y-o-Y) growth on the basis of form, application and region. The report also emphasizes on the dynamics prevailing in the methyl ester sulfonate market and provides crucial information regarding the segments in the global methyl ester sulfonate market. To provide an enhanced understanding and assist stakeholders in decision making and market exploration, the report comes integrated with a study of the drivers, restraints and trends that impact the existing market situation and are expected to influence the global methyl ester sulfonate market over the forecast period. The analysis delivers data for 2017 along with a market forecast for the period 2018–2026. To describe market opportunities and trends, the global methyl ester sulfonate market report has been categorically divided into different sections on the basis of form, application and region. The report commences with a market overview and delivers market definition and taxonomy along with value chain and driver & pricing analysis. Following this, the methyl ester sulfonate market background has been covered, which comprises the factors affecting the methyl ester sulfonate market, such as macro-economic factors. The macro-economic factors include global statistics for the personal care industry, overview manufacturing sector growth, GDP growth outlook and chemical sales overview. The market background also covers the market dynamics that impact the methyl ester sulfonate market. The dynamics enclosed in the report are drivers, restraints and trends. The market background also comprises the value chain analysis where the flow of methyl ester sulfonates from the raw material suppliers to methyl ester sulfonate manufacturers to the end users through various distributors and retailers involved has been enclosed. The last part in the market background is the forecast factors, which comprise the factors that are estimated to influence the global methyl ester sulfonate market, such as the increasing consumption of personal care products. The subsequent sections entail the global methyl ester sulfonate market analysis by form, application and region/country. All the mentioned sections analyze the market on the basis of numerous aspects affecting the market. Each section includes the qualitative and quantitative characteristics of the global methyl ester sulfonate market. To provide a brief idea about revenue opportunities from the application, form, and region/country-wise segments, the report also delivers market value (US$ Mn) data, growth rates, market shares and total incremental $ opportunity indices for each segment over the forecast period (2018–2026). In the concluding section of the report, we have delivered a comprehensive competition scenario with company market share and performance in order to offer report audiences with a dashboard view of the main players operating in the global methyl ester sulfonate market along with their business strategies. This would assist clients to assess strategies utilized by market leaders and develop effective strategies accordingly. For market data analysis, we have considered 2017 as the base year with market numbers estimated for 2018 and a forecast made for 2018–2026. To define the market, we have traced down the production of key players, such Lion Corporation and Stepan Company. The PMR calculation is based on a multipronged approach that consists of secondary and primary research and triangulation of data obtained therefrom. During the early phase of research work, product mapping was done, in which the product form offered by major players with respect to application area was identified. Further, in secondary research, data accessible in public domains, such as industry associations, company annual reports, white papers, publications, journals and government sites, among other sources, was composed and accordingly, a set of data points were built. For the same, a top-down approach was used to evaluate market numbers for each type and a top-down approach was used to counter-validate the market assessment. For forecast calculation, forecast growth of end-use applications such as personal care products, detergents & dish wash, and supplementary factors impacting the consumption of methyl ester sulfonate were taken into account. The forecast presented in the report assesses the actual market size (US$ Mn) in 2017 with regard to methyl ester sulfonate and the expected market value in the global methyl ester sulfonate market over the forecast period. We have also considered the different segments of the global methyl ester sulfonate market in terms of Basis Point Share (BPS) to comprehend each individual segment’s relative contribution to market growth. This exhaustive level of information is essential for recognizing various key trends prevailing the global methyl ester sulfonate market. The report also evaluates the global methyl ester sulfonate market based on incremental $ opportunity & global absolute $ opportunity. This is usually overlooked while approximating the market forecast; however, from a business perspective, it is important to study the market attractiveness in terms of three indices, viz. 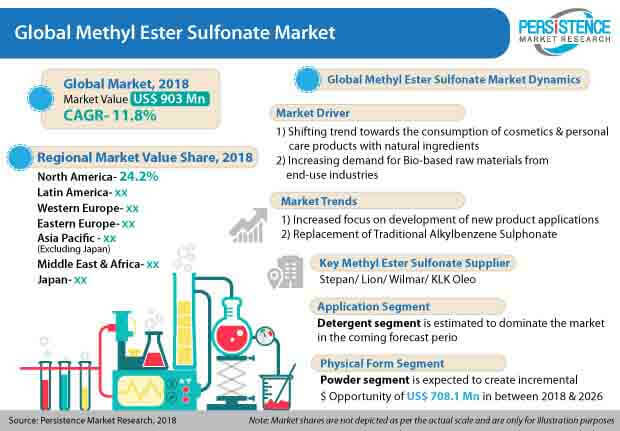 market share index, CAGR index and incremental $ opportunity index, to identify the high potential resources in the methyl ester sulfonate market. Moreover, the market attractiveness index will help readers understand the key segments in terms of their performance and growth in the global methyl ester sulfonate market. The Methyl Ester Sulfonate report delivers insights about volume (KT) and value (US$ Mn) forecasts, market trends competition, market dynamics and latest developments in global Methyl Ester Sulfonate market for the analysis period 2018 to 2026. The global methyl ester sulfonate market is estimated to be pegged at US$ 903.0 Mn by 2018 end and is forecast to reach US$ 2,199.6 Mn by the end of 2026, with a significant CAGR of 11.8% over the forecast period. The global methyl ester sulfonate market is expected to present an incremental opportunity of US$ 1,296.6 Mn between 2018 and 2026. The demand for methyl ester sulfonate is anticipated to observe significant growth over the forecast period, owing to the changing consumer sentiments towards bio-based products such as bio-detergents. Methyl Ester Sulfonate (MES) is categorized as an anionic surfactant derived from oleo chemical feedstock by the sulfonation of saturated fatty acid methyl ester, which is a derivative of natural fatty acid and oils. Methyl ester sulfonate is used in the manufacturing of laundry detergent powders & laundry detergent soaps as well as personal care products, such as shampoos & soaps along with dish wash. In the recent times, there has been considerable focus on hydrogenated and highly refined methyl ester feedstock by manufacturers. Methyl ester sulfonate is derived from renewable natural resources and possess high detergency and calcium ion stability. Apart from this, methyl ester sulfonate is less toxic and easily bio-degradable. Rapid growth in urban population, mainly in emerging countries, is anticipated to drive economic development. Growth in the younger population has increased spending on personal care products as more importance is being given to grooming and styling these days. Simultaneously, increasing environmental concerns have surged the demand for bio-based personal care products, which has been surging the demand for methyl ester sulfonate from the personal care industry. The improving standard of living is fuelling the demand for business-casual clothing. That apart, growing interest in fashion and growing self-awareness have also led to an increase in the demand for clothing options. This demand for clothing has subsequently led to an increase in the demand for laundry detergents. Rising penetration of washing machines in developing economies is also expected to drive the demand for cost-effective detergents during the forecast period. Increasing preference of manufacturers towards the use of bio-based raw materials is another factor expected to drive the demand for methyl ester sulfonate during the forecast period. Linear alkylbenzene sulfonate is widely used a raw material ingredient in the manufacturing of detergents; however, the price of alkylbenzene sulfonate has been increasing. Alkylbenzene sulfonate is a petroleum-derived product and a number of regulations are being imposed on it, as it is non-renewable. Methyl ester sulfonate can tackle problems related to alkylbenzene sulfonate as it is renewable, less toxic, bio-degradable and less expensive. This particular factor is expected to propel the demand for methyl ester sulfonate in the coming years. The growth of the methyl ester sulfonate market is pegged to be determined by socio-economic trends, such as increasing population and rising spending capacity of middle-class in the growing markets of India and China. Steady economic growth in developing countries, such as China, India, and ASEAN countries, and rising per capita disposable income and expenditure in these regions are the major factors expected to drive the demand for laundry products and personal care products. This consumer market growth in developing regions is expected to in turn help drive the growth of raw material markets, such as the methyl ester sulfonate market. In regions such as North America and Europe, the demand for methyl ester sulfonates is expected to plunge slightly, owing to the shifting trend towards the use of liquid detergents. In spite of this downturn, North America and Europe are estimated to be potential markets for methyl ester sulfonates, owing to the surging demand for bio-detergents in these regions, due to the ever rising environmental concern. A few of the key market participants covered in the study of the global methyl ester sulfonate market include Stepan Company, Lion Corporation, KLK Oleo, Wilmar International Ltd. and Guangzhou Keylink Chemical Co., Ltd., among others. Guangzhou Keylink Chemical Co., Ltd.
Sinopec Jinling Petrochemical Co., Ltd.